“Only when we become convinced that there is an incoming attack on the territory of Russia, and that happens within seconds, only after that, we would launch a retaliatory strike,” Putin said during an international policy forum in Sochi, the Black Sea resort. Neither the United States nor its NATO allies have ever made a “no-first-use” pledge, a promise not to use nuclear weapons in war or to launch a pre-emptive “first strike” with them.“NATO has always opposed a US ‘no-first-use” declaration and has never ruled out US first-use under its ‘flexible response’ posture since 1967,” wrote Ankit Panda in the July 2018 issue of Council on Foreign Relations online. In 1964, China made the unequivocal pledge “not to be the first to use nuclear weapons at any time or under any circumstances,” and has reiterated the promise many times. China has also called on nuclear weapon states to establish an international no-first-use treaty. India made a no-first-use promise in 2003, and North Korea declared the same on May 7, 2016. —Associated Press; KIRO-7 News, Seattle, Wash.; “Putin: Russia would only use its nuclear arms in retaliation,” Oct. 18, 2018; The Independent, “North Korea will not use its nuclear weapons first, Kim Jong-un tells Congress,” May 8, 2016. Extreme fluctuations in relations between North Korea and the rest of the world in recent months have kept war hawks and peace doves at the edge of their seats. At one moment the United States and North Korea were lobbing nuclear threats at one another, sounding closer than ever in recent history to a potential military conflict. 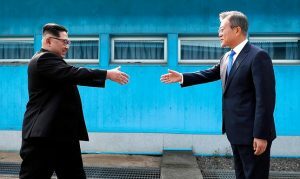 In the next moment, North and South Korea were signing a “Peace Declaration” to denuclearize the Korean peninsula at an unprecedented meeting in the Demilitarized Zone. A historic summit between the presidents of North Korea and the United States was announced, then cancelled by Mr. Trump, and, then went ahead. Finally the Singapore Summit brought a sigh of cautious relief with many hopeful signs that relations will continue in the direction of peace. The new approaches to these relations are in line with the agendas of changing leadership of the three countries and understanding those help explain the unfolding news. As North Korea is now a nuclear weapons state, the official US government position was to demand “complete, verifiable and irreversible denuclearization of North Korea.” Skeptics of the motives behind US leadership allege that the summit was planned to fail; that is, the US projects an image of working toward reconciliation while never having disavowed bellicose intentions. A week after the Summit, those fears have yet to be affirmed. Throwing a curveball into the decades-long US policy of military threats, diplomatic hostility, and harsh trade sanctions, is the US “dealmaker” seeking to fulfill his need for celebrity, and desires for economic expansion into new territories and cutting military costs related to defense of other nations. “President Trump should win the Nobel Peace Prize,” suggested South Korean President Moon Jae-in. This absurd prospect may have strategically furthered the continued opening of diplomatic relations with North Korea. The tension between those supporting long-standing US policy and others embracing Trump’s chaotic treatment of North Korean President Kim Jong-un (calling him a “madman” one month and “honorable” the next) has led to roller coaster relations. North Koreans have a justified fear that the US is looking for regime change. Both John Bolton, the recently appointed National Security Advisor, and Vice President Mike Pence have promoted the “Libyan model” in relation to the North. In Libya, relief from sanctions was offered in exchange for international oversight as the country relinquished its nuclear weapons program in 2003. Despite Libya’s disarmament, it was bombarded by the US and NATO allies in 2011, and Col. Muammar Gaddafi was publicly assassinated by US-supported militias. Additionally, the North views the regular joint military exercises by the US and South Korea as rehearsals for invasion and regime change. 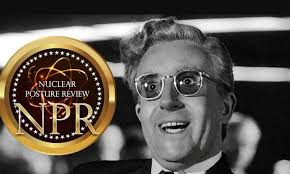 On June 17 Trump announced a halt to the exercises which he even referred as “war games.” The North has long offered denuclearization in exchange for a halt to the exercises and a non-aggression pact. Again in May, a statement from the South Korean president’s office said: “The North showed willingness on denuclearization…. If military threats to North Korea decrease and regime safety is guaranteed, the North showed that it has no reason to retain nukes.” And now, that was agreed to in the peace agreement in Singapore. North Korea agreed to “work toward complete denuclearization of the Korean Peninsula” while the United States “committed to provide security guarantees” to North Korea. High on the North Korean priority list are a peace treaty, a non-aggression pact, an end to the military drills, but also energy and food to ameliorate chronic malnourishment. “The policy of the North Koreans has been something called the Byungjin Line and it has been a dual track. One has been the pursuit of its nuclear and missile program,” said Christine Ahn, of Women Cross DMZ. “The other track has been improving the economy of North Korea, and that is so critical to understanding what is the incentive also for North Korea to be willing to give up its nuclear weapons, because they want so much to advance their economy,” she said. Whatever may happen between the United States and North Korea, there are high expectations for realization of parts of the Declaration of Peace between South and North Korea. That is what drove the South Korean grassroots movement that led the candlelight revolution when, according to Ahn, “almost for half a year where one in three South Koreans, 16 million people took to the streets to call for the impeachment of [President] Park Geun-hye” and in turn elected Moon Jae-in. Within two months of being elected Moon Jae-in reached out to North Korean leader Kim Jong-un to meet. On Jan 1, 2018 Kim accepted the offer, followed by a slew of diplomatic moves fostering new levels of trust and common ground among the US, South Korea and North Korea. On April 27 the two Korean leaders met in Panmunjeom. Kim Jong-un was the first North Korean leader to ever set foot inside South Korea. Some of the specific points of the Declaration have begun to be fulfilled. The week after it was signed, South Korea ended their loudspeaker broadcast into North Korea. South Korean police even prevented activists from unloading a truck with 5,000 anti-North Korean leaflets. North Korea shifted its clocks by 30 minutes to be in sync with South Korea. A direct telephone link between the two leaders has been set up. Other gestures indicating openness to reconciliation have been made. In addition to freezing nuclear weapons testing, North Korea has unilaterally destroyed its underground nuclear testing facility, and on May 9 released three United States prisoners. In the Singapore Summit North Korea also committed to returning remains of US veterans of the Korean War. Even the United States has made concessions. According to the New York Times on May 3, Trump ordered the Pentagon to find ways to reduce the number of troops in South Korea. Later in May Trump abandoned further sanctions that he had been seeking. The South Korean movement that nonviolently overthrew Park Geun-hye lit the fire for peace in Korea. The momentum for peace has been built and shot down over and over. Today it is moving in a direction that lets the doves be optimistic about one thing for the first time in a long time, even if for a brief moment. Today’s sanctions against North Korea are inflicting the same sort of privations against blameless starving infants, children, their mothers and grandparents. Lee Eugene from South Korea’s Ministry of Unification said last September that the latest sanctions make North Korea’s malnourished children, nursing mothers and the elderly even more vulnerable. (9-16-17) Foreign visitors to the North report that sanctions haven’t changed life for the elite, while ordinary people lack tools, running water, and needed medicines in clinics. 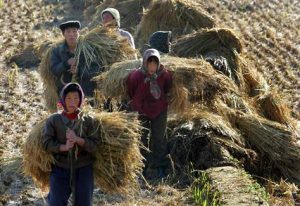 Experts have estimated that between 1995 and 1998, two-to-three million North Koreans died of starvation and famine-related illnesses, mainly children and the elderly. Out of a population of 22 million in 1998, this was one of the worst famines of the 20th century. But don’t shed a tear for the victims of avoidable mass starvation, because the North is a deadly threat of ferocious strength and cunning, so fearsome that Mark McDonald in the New York Times warned readers in January 2011 to be “concerned” that the North could use “further intrigues” and “nuclear capabilities to force food aid” from the US and South Korea. (NYT, 1-2-11) Those commies never fight fair, as Phil Oaks said. In spite of the North’s long-standing need for a more diverse food supply, and the fact that two-thirds of all North Koreans were enduring chronic food shortages (NYT 8-5-12), South Korean government and private aide for the North dropped “more than 95 percent” between 2007 and 2012. In Feb. 2012, the Obama White House was still using food as a weapon. US negotiator Glyn Davies gave the impression of holding up 240,000 tons of energy bars and and grains contending that it could easily be transferred to the North Korean Army. Both the US and South Korean governments deny using malnutrition as a bargaining chip, but in Nov. 2011, S. Korean unification minister Yu Woo-ik said in Beijing that his bosses would not make a major shipment of rice unless North Korea apologized for shelling a South Korean island the previous November.